How many times have we heard that ‘All Lives Matter’ or ‘Blue Lives Matter’ shouldn’t be used in the same context as ‘Black Lives Matter’? The Left is in fear that chanting All Lives Matter or Blue Lives Matter is an attempt to take away from the importance of Black Lives Matter. However, the hypocrisy of the Left is once again proven, as “Black Lives Matter!” chants interrupted a moment of silence for our fallen officers at the Democrat National Convention (DNC). 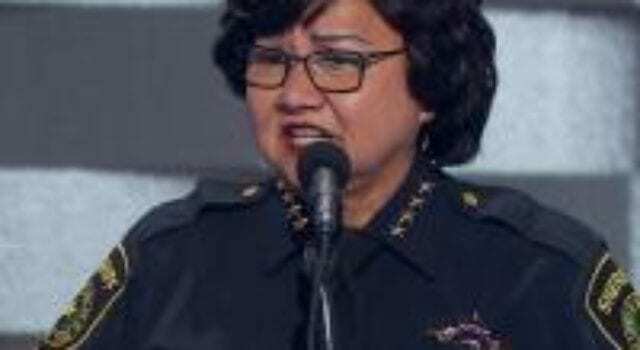 Dallas County Sheriff Lupe Valdez spoke out at the DNC and called for a moment of silence. Within seconds, “Black Lives Matter” shouts were heard in the audience. An audience member recorded, as the video shows a few members of the crowd that began to chant. A few people in the crowd waved them off, signaling a stop to the disrespectful act. The level of sheer disrespect is certainly clear. The Left cares for no other movements or causes other than their own. And how about that level of hypocrisy? Listen to Sheriff Valdez’s speech and its interruption here at FoxNews. Previous articleJohn Kerry fears air conditioners more than ISIS! Next articleHey Americans, we are bombing Libya… NO JOKE!